I love the Garden, so much is in the story. Nonetheless, the blog prior emphasized ungratefulness. This go round is something I recently had to learn and deal with. 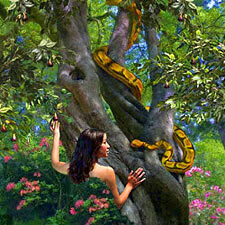 After the serpent shifted Eve’s focus to the one and only tree of a hundred (hypothetically) that she could not have, he caused her to do something else that was detrimental. He made her doubt what the Lord said. Eve knew what God has said, because of Adam had told her. However, after losing focus, she enabled herself to become vulnerable to others’ opinions. Even in my own life, I knew what God said, but there were others around me that would give their opinions and insight, they wasn’t even necessarily bad, but, it just wasn’t what God said. In the same way, I knew what I wanted and I wanted it at the moment, so my selfish desires also blocked by vision. Nonetheless, I begin to doubt and reconsider what God had told me, and I got my emotions all mixed up and almost took matters into my own hands. Yet, by the grace of God and the power of his word, I found solace in knowing that what God said is what God said; no one can change what He said. This is why we have to keep God’s word in our hearts. There are so many voices and opinions and influences in this world, it can become harder and harder to decipher what is really the voice of God. Still, the closer we draw to Him, the clearer his voice becomes, no compromise, no doubt. Don’t make the same mistake Eve did. God said it. I believe it. That settles it. Your purpose depends on it.